Tendon and ligament are two types of dense connective tissues found in humans. Both tendon and ligament are important in structural support by connecting skeletal muscles and bones. Consequently, tendons and ligaments aid the flexibility of the body. Both tendons and ligaments are composed of collagen fibers. Tendons can be found at the ends of the skeletal muscles whereas ligaments can be found in bones. The main difference between tendon and ligament is that a tendon joins a skeletal muscle to a bone whereas a ligament joins a bone to another bone. Ligaments help the formation and functioning of joints. A tendon is a tough cord of dense white fibrous connective tissue, which unites muscles with a bone, transmitting the forces exerted by muscles to the bone. Tendons can be found at the end of the skeletal muscles. Tendons have the highest tensile strength among other soft tissues in the body. This tensile strength is important to withstand the stress generated during muscular contractions. The tensile strength is caused by the tissue composition and the parallel orientation of connective tissue fibers. 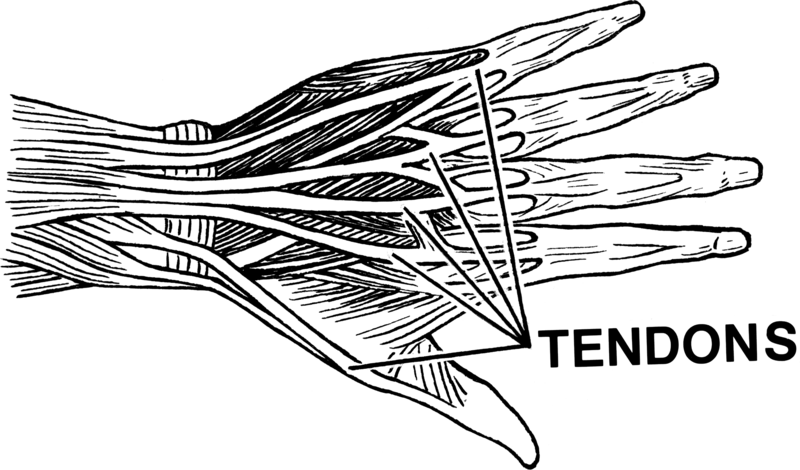 Tendons in the hand are shown in figure 1. The fibrous connective tissue that makes up the tendon is mainly composed of collagen fibers. The basic units of the tendon are the primary collagen fibers. A bunch of collagen fibrils forms a primary collagen fiber. A bunch of primary collagen fibers forms a primary fiber bundle. The primary fiber bundle is also called a subfasicle. A group of subfasicles forms a secondary fiber bundle, which is also called a fascicle. Multiple fascicles form a tertiary fiber bundle. The tertiary fiber bundle forms a tendon unit. The primary, secondary, and tertiary fiber bundles are wrapped by a connective tissue sheath called endotenon. A tendon unit is wrapped with another connective tissue sheath called epitenon. The tendon hierarchy and organization is shown in figure 2. The two primary cell types of a tendon are tenocytes and tenoblasts. Tenocytes are a matures type of cells derived from fibrocytes whereas tenoblasts are immature cells derived from fibroblasts. Tenoblasts give rise to tenocytes. Tenoblasts can be found in clusters, which are free from collagen fibers. Tenocytes are attached to the collagen fibers. Tenoblasts secret collagen and the extracellular matrix of the tendon. A ligament is a tough band of fibrous connective tissues that connect articular extremities of bones. The fibrous connective tissue of ligaments is made up of highly dense collagen fibers, spindle-shaped cells called fibrocytes, and a very few ground substances. The two types of ligaments are white fibrous ligaments and yellow fibrous ligaments. Since white ligament is composed of more collagen fibers, it is more sturdy and inelastic. The yellow ligament is rich in elastic fibers. Ligaments enclose the articulated ends of bones. They also lubricate the synovial membrane. 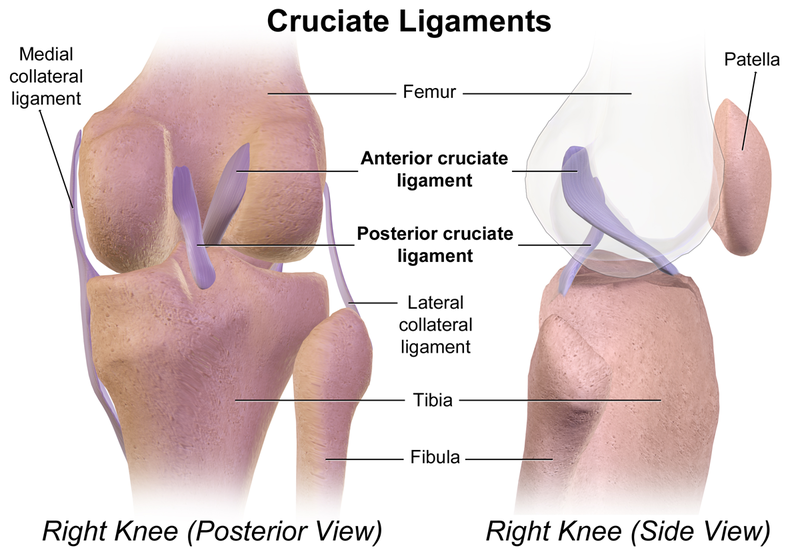 The ligaments in the knee joint are shown in figure 2. Tendon and ligament are components of the musculoskeletal system. Both tendons and ligaments are types of fibrous connective tissue. Both tendons and ligaments are made up of dense layers of collagen fibers. Both tendons and ligaments are sturdy. Both tendons and ligaments are important in the structural support and the flexibility of the body. Applying of excessive force on tendons and ligaments cause injuries. Tendon: Tendon is a flexible, inelastic cord of fibrous tissues, which attaches the skeletal muscle to a bone. Ligament: Ligament is a short band of a flexible fibrous connective tissue, which connects two bones or cartilages or holds a joint together. Tendon: A tendon joins a skeletal muscle to a bone. Ligament: A ligament joins a bone to another bone. Tendon: Tendons can be found at the ends of the skeletal muscles. Ligament: Ligaments can be found in joints. Tendon: A tendon is inelastic and tough. Ligament: A ligament is elastic and strong. Tendon: A tendon is a modification of a white fibrous tissue. Ligament: A ligament is a modification of a white or yellow elastic tissue. Ligaments contain collagen fibers. Tendon: Fibroblasts can be found in continuous rows in a tendon. 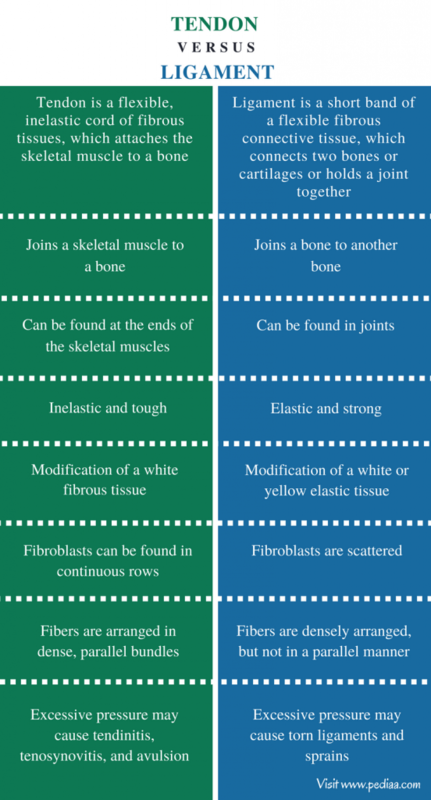 Ligament: Fibroblasts are scattered in a ligament. Tendon: Fibers are arranged in dense, parallel bundles in a tendon. Ligament: Fibers are densely arranged in a ligament but not in a parallel manner. Tendon: The elongated tendon cells can be found in between the fiber bundles of the tendon. Ligament: the elongated tendon cells can be found in between fibers of the ligament. Tendon: Excessive pressure may cause tendinitis, tenosynovitis, and avulsion. Ligament: Excessive pressure may cause torn ligaments and sprains. Tendon and ligament are two types of dense fibrous connective tissues found in the human body. Tendons can be found at the ends of the skeletal muscles. They join the skeletal muscles to the bones. Ligaments can be found in joints. They join one bone to the other. Therefore, the main difference between tendon and ligament is their function. 1. “Tendon.” Encyclopædia Britannica. Encyclopædia Britannica, inc., n.d. Web. Available here. 09 Aug. 2017. 2. Frank, C. B. “Ligament structure, physiology and function.” Journal of musculoskeletal & neuronal interactions.U.S. National Library of Medicine, June 2004. Web. Available here. 09 Aug. 2017.